February is HEART HEALTH MONTH! Please come join us to discuss how to take better care of the most important muscle you have...YOUR HEART!! We will share how exercise (or lack of) affects your heart as well as how optimal nutrition can play a key roll in your heart health. 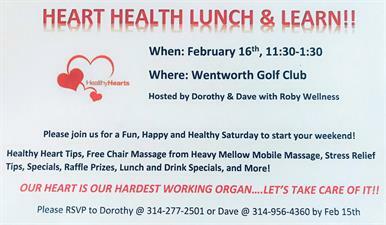 As an added bonus Adelia Bennett, Licensed Massge Therapist and owner of Heavy Mellow Mobile Message will be their to give chair messages to anyone who would like one.